Thank you for confirming your e-mail address. 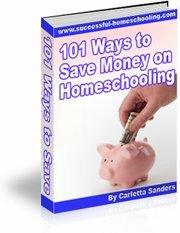 As promised, here's your FREE copy of 101 Ways to Save Money on Homeschooling. As an added bonus, you'll also receive a subscription to our monthly e-zine, which contains additional information and ideas to enrich your homeschool journey. Click here to continue your visit with Successful Homeschooling, or select a page from the navigation menu on the left.